Brown quips after signing the state budget Thursday. Standing from left: Assembly Budget Chair Bob Blumenfield, Assembly Speaker John Perez, Senate President pro Tem Darrell Steinberg, Senate Budget Chair Mark Leno. 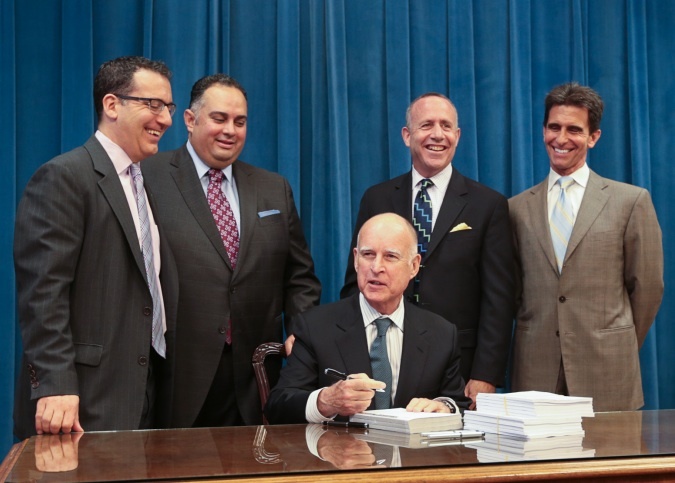 The budget for the fiscal year that begins July 1 invests “in what people care most about – health care and education,” Brown said in a signing ceremony with leading legislators and administration officials at the Capitol. It includes Brown’s top education priority – the biggest reform of the way the state finances its K-12 schools since the passage of Proposition 13, along with $2.1 billion to begin to roll it out – and it includes the adoption of a provision in the federal Affordable Care Act extending the Medi-Cal program to 1.4 additional Californians. The federal government will pick up the full tab of their care for the next three years, after which the state will pay for 10 percent of the cost. With the passage of Proposition 30 in November, providing an average of $6 million more in revenue for seven years, Brown could claim legitimately that “for the first time in a decade or more state finances are in solid shape.” The budget projects a surplus of $1 billion by June 30 2014. Both Senate President pro Tem Darrell Steinberg and Assembly Speaker John Perez got what they wanted as well. For Steinberg, it was a restoration of dental care for 3 million adults, along with more money for mental health; for Perez, tuition aid to CSU and UC schools for families earning up to $150,000. Read previous EdSource Today coverage on the budget.